I’ve just realised that I haven’t posted any photos of new notebooks since early March, which is pretty poor considering my main craft is bookbinding! I haven’t been idle, I have a pile of books which are waiting to be listed on Etsy, I just haven’t got round to it yet. I’ll remedy that in the next few days. In the meantime I had an unusual commission last weekend. 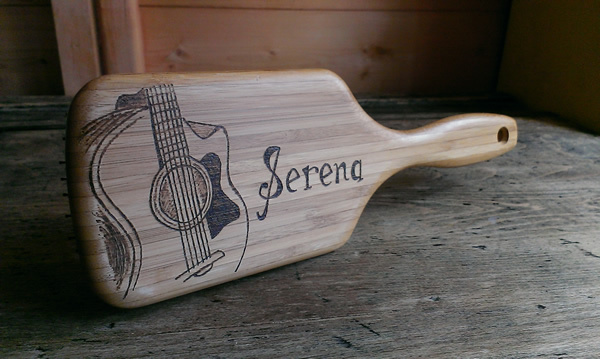 One of my gardening clients (or, rather, her youngest daughter) wanted a hairbrush personalised for one of her friends. Not my usual thing, but I’m always up for a challenge! They provided the brush, told me what they wanted on it (a guitar, and the friend’s name), and then left it with me. 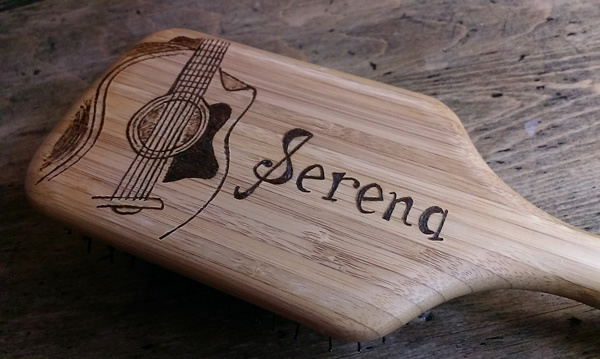 I found a picture of a guitar I liked the look of, simplified it somewhat, got busy with the pyrography iron, and voila!